Investors waiting to cash in on this stock's great potential may want to consider some of the risks as well. Intrexon's (NASDAQ:XON) sheer number of shots on goal shows tremendous promise for the engineered biology conglomerate. Products in development or nearing commercial launch include everything from genetically engineered mosquitoes for public health to pet cloning services, and from CAR-T immunotherapy to controlled flowering of agricultural crops. Of course, as with any stock, there are always risks and pitfalls. 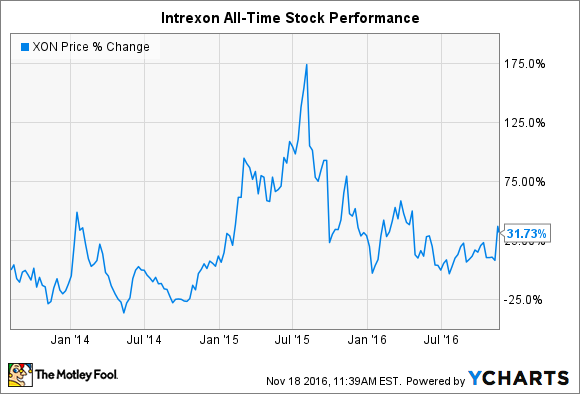 So while I recently went over three reasons the company's shares could rise, let's now consider three reasons Intrexon's stock could fall. My bull thesis for Intrexon centered on its most obvious source of potential growth: new product launches. On the flip side, any unexpected hiccups in product launches could have consequences for investors. Unfortunately, when you're playing in the field of engineered biology, the potential roadblocks can span technical, consumer, and regulatory factors. It's difficult enough to develop products that provide real value in the market -- for farmers, patients, consumers, ingredient formulators, or other customers -- but the dirty secret of technology development is that even true innovations can be complete market duds. Why? As Dartmouth professor of business strategy Ron Adner explains in his book The Wide Lens, any single technology exists not by itself or on its own merits, but within a complex ecosystem of technologies. Sometimes incumbent technologies have a quantifiable market edge; sometimes the success of newcomers is dependent on the arrival of other technologies or regulatory frameworks that don't yet exist. To date, the industrial biotech field has seen its fair share of great technologies fail for reasons outside of the innovator's control. Success is more nuanced than we care to acknowledge, especially when biology is the technology in question. Intrexon does seem to have some legitimate winners on its hands, but that doesn't guarantee that engineered mosquitoes, high-protein fish and animal feed, or non-browning apples will prove wildly successful or launch smoothly. Consider that the company has been establishing a presence and rapport with public officials and citizens in Florida for years, and yet local governments in Key West still put the decision for allowing open field trials of genetically engineered mosquitoes to a public referendum on the Nov. 8 ballot. A mixed decision pushed back the earliest possible date for full regulatory approval to the second half of 2017. Whether investors want to admit it or not, unexpected setbacks from any number of sources could cause some short-term pain for Intrexon. Intrexon's stock soared to an all-time high in mid-2015 on the heels of several biopharma deals, the most significant being a CAR-T partnership with the MD Anderson Cancer Center and Ziopharm, announced at the beginning of that year. While the stock has receded since then, a good deal of its $3 billion market cap still appears to be supported by the company's potential in cancer immunotherapy. Aside from the fact that the investing craze around CAR-T is unsustainable and fed on hype in general, there are a few remaining issues for Intrexon investors. First, the company arrived a little late to the CAR-T party (although SEC filings show it stipulated that the deal couldn't be announced until the J.P. Morgan Healthcare Conference for maximum coverage). That means even in a best-case scenario -- i.e., full market approval of its therapy for at least one indication -- Intrexon will likely not be the first to market. To make up for that potential outcome, the company's therapy will need to be substantially better than other therapies to gain market share. That is possible, but one major critique of the technology licensed by Intrexon, called Sleeping Beauty, is that it isn't very effective. Intrexon and Ziopharm claim that they'll overcome efficacy worries with an innovative delivery method combined with a method for controlling activation within the body. The latter is part of Intrexon's RheoSwitch technology, which has actually never been included in a clinical product in nearly two decades of existence. It has been part of several failed and discontinued clinical trials. The simple fact is that expectations for Intrexon's CAR-T programs outpace the capabilities the technology has demonstrated to date, which remains one of the largest risks for investors in the stock. The single largest risk for Intrexon investors is the source of revenue growth. In 2015, over 75% of the company's revenue came from services and collaboration licensing, while the remainder was generated from a single product portfolio. Overdependence in itself may not set off alarm bells, especially for a company that has yet to launch some of its most promising products. The worrisome part is that Intrexon is overly dependent on services and collaboration licensing revenue from small-cap and micro-cap companies -- some of which seem only to exist to serve Intrexon. Consider that of all the revenue Intrexon generated in 2015, only 5% came from providing value to companies worth more than $1 billion. Companies with market caps under $1 billion provided 34% of total revenue last year, which jumps to 44% when product revenue is excluded. That could be much higher than reported, considering that 11% of total revenue is classified as "other." The dependence on questionable customers has only deepened in 2016. Companies worth less than $1 billion have been responsible for more than 100% of Intrexon's revenue growth so far this year, because product revenue has actually fallen year over year. This represents a significant risk that investors need to consider. The dependence on small-cap and micro-cap companies suggests that bigger companies -- the technology leaders of their fields -- are largely uninterested in Intrexon's core technologies. That's a troubling sign, and it only strengthens charges that a bulk of the company's core technologies don't actually work. Intrexon has a lot of moving parts that make it difficult to value and analyze. That has been interpreted as an overwhelmingly positive sign by Mr. Market, but sometimes the complexity is intentional. While the company may not be the next SunEdison or Valeant Pharmaceuticals, there are above-average risks that investors need to fully consider. If the stock falls in the near future, then the reasons above are the likely culprits.